I’m sitting here almost completely packed and waiting to go to the airport to leave Saudi and start the next chapter of my adventures. I have 5 more hours to kill before I can go to the airport, where I will wait some more, before flying to my connecting airport and wait 5 more hours for my flight out of the Kingdom. So as a semi-productive use of all that time, I’m going to try to finish up the last stories from my time in the Middle East. So here’s the final chapter in the Royal Decree Holiday Series (March 19-27, 2015). After our Nile river cruise and a buffet lunch it was time to head off toward the main attraction, the Great Pyramids at Giza! We had to drive quite a ways through the city and it was disparaging to see the half built state of the buildings. Our guide told us that the buildings were mostly left unfinished and people moved into them anyway. The government tried to smooth over the unrest caused by this condition by providing free or cheap satellite tv to the residents, but it backfired because they ended up seeing much more of the world that way, and it only served to highlight their situation. Unsurprisingly, the tour took us to a shop. It’s not unusual for tours to take groups to the shops of their friends and family. I found out that for Arabs this is actually an anticipated part of the tour, and they are sad when it is left out, whereas Westerners tend to get a little annoyed and feel like they are being scammed. I didn’t mind this one because it was also quite instructional. It was a papyrus art store, and they had really cool little demonstration booths that showed us how traditional papyrus paper is made from the papyrus plant. The plant is naturally fibrous, so they slice it into long strips (the size they want the finished scroll to be), soak them for ages (the longer the soak, the darker the paper will be), then weave them together and press them for more ages. The whole thing takes a couple of weeks. The sugars in the plant act like a glue and bind all the fibers together while they are pressed. When it comes out, it has a clear and visible texture showing the woven strips of papyrus. And, as it turns out, you can wash papyrus paper once it’s all finished and it won’t disintegrate like tree paper. Pretty cool. I was also totally suckered in and bought a family tree and had them write the names of my mother, my sister and her two little kids into the cartouches in hieroglyphs. I don’t often souvenir for myself, but I did promise to be the crazy aunt who travels all over the world and brings back cool stuff. Shortly after we left the shop, the guide pointed out to us that we could see the tops of the pyramids in the distance, which was really surreal. All the movies and photos make it look like they are in the middle of nowhere in the desert, but they’re really right on the edge of the city. 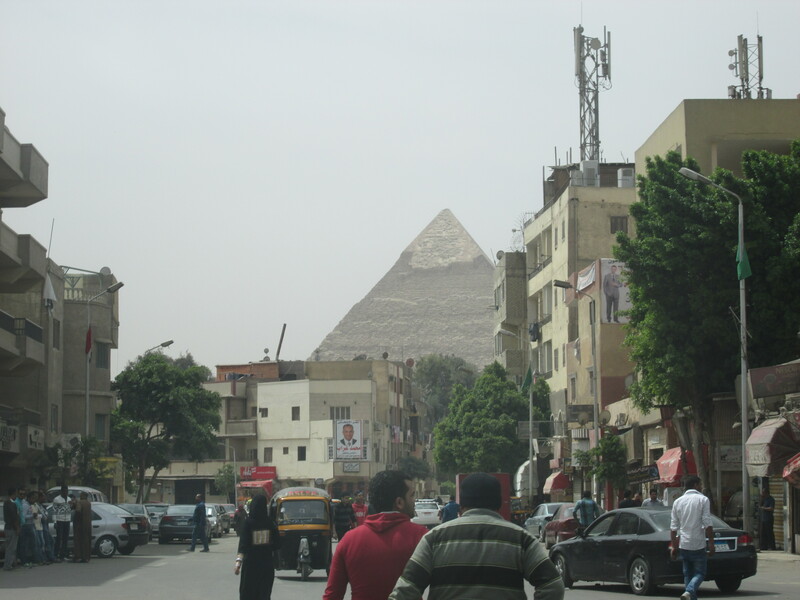 Cairo is actually only on the east side of the Nile, so the city we were in now was technically Giza, once reserved only for the dead, the western side of the Nile started accommodating living residents when the population in Cairo became too dense. Our first glimpses of the pyramids were still quite far away and the amount of driving we still had to go gave some slight indication of the massive scale. The closer we got, the larger the structures loomed and the worse the neighborhoods got. Garbage on the streets, shacks and shanty buildings, increasingly run down cars and also more horses or mule drawn carts. Our guide told us that there were almost no new cars in Egypt because of the high taxes on new imported cars (and there are no Egyptian car companies). Since petrol is really cheap in the region, most people see no benefit in buying newer, more fuel efficient cars and just drive their old gas guzzlers until even duct tape can’t hold them together anymore. The pyramids themselves are of course a massive tourist attraction, but to be honest, I had expected to see more people. It wasn’t like we had them all to ourselves, but I don’t think there were more than a few dozen tourists out there. In fact, there may have been more locals in the form of tour guides, security guards, and trinket sellers than there were tourists. We had to pass through some security, a standard bag scanner and metal detector, and then we were in the park. Our guide did a good job of making sure we always had plenty of time to take pictures at all the best picture spots. 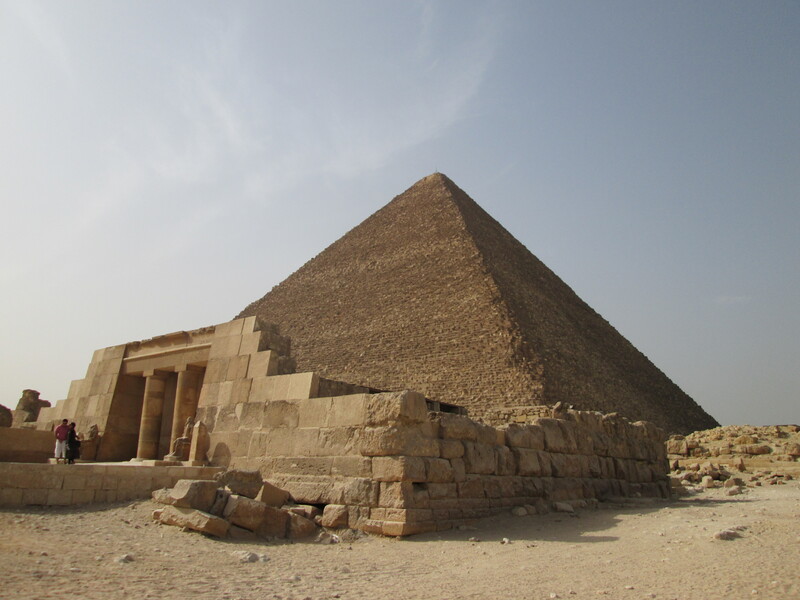 And he took some silly pictures for us, using perspective to make it look like a person was touching the tip of the pyramid with their outstretched finger. These photo ops only get more ridiculous as we go on. I think for a while, my brain was just rejecting the idea that it was real. All the experiential data I ever had with the pyramids was in 2d representation, after all. It’s a very strange feeling when your brain takes something so familiar and has to rewrite the entire thing. I really did try to listen to the guide, but most of what he was saying was stuff I already knew from decades of documentary watching. 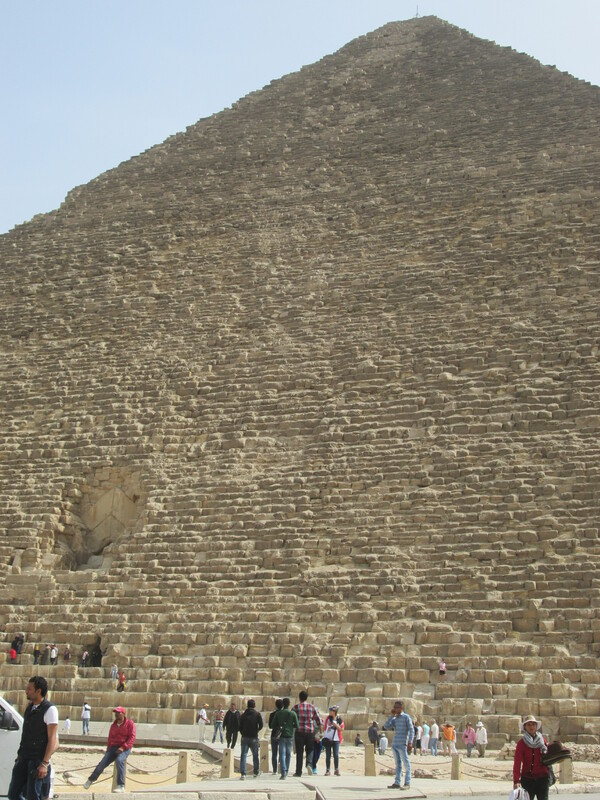 Instead I kept staring at the pyramid next to us, watching people climbing on the lower blocks and boggling at how easy it is too completely loose perspective without something for scale. I mean, we know the blocks are big, but since all the blocks are big and the backdrop is a desert (the city was behind us) it’s hard to keep in mind just how big, and then you see a person who is standing next to a block that is as tall as they are. I know it sounds trite, but it really makes you marvel at the people who built it. I mean, the Great Wall is also a marvelous feat of engineering, but at least the stone blocks that make it up could be moved by a small team of men at most. It’s a lot of labor, but it’s labor that makes sense. It’s that stunning difference between knowing a fact from a book or tv, and feeling that idea for yourself. I will never get tired of that. We climbed over the front of the large pyramid for a while, taking pictures and feeling the stones, examining the well known spaces between which a piece of paper cannot fit and just generally feeling giddy (nope, that wasn’t just me) then we piled back in the van to drive around to a viewing platform where we could see them a little better. This was a pretty surreal view, because from this place, we could see the grouping of pyramids but with the city as the backdrop instead of the desert. I met an au pair there from Spain who was with the family she worked for on holiday in Sharm. Her boss had given her the day off to come to Cairo and she was near tears with the excitement of actually being at the pyramids. We took more pictures, and she and I talked about what the pyramids meant to us. I really can’t say enough how different being there is from seeing it, even in IMAX. It’s like waking up from a really cool dream to find out that it’s real after all. It was so nice to find another person who felt the same way about it. Sometimes I think travelers can get inured to the wonders, or simply go to places to check them off a list. Lists can be great, but not if they’re the only reason you’re going. There are things that, when you see them, they will change you if you let them. Your world gets bigger and more amazing than it was before, and even if you forget sometimes, the memory can remind you that amazing stuff is out there, and you can see it. From the viewing platform, we had a choice. 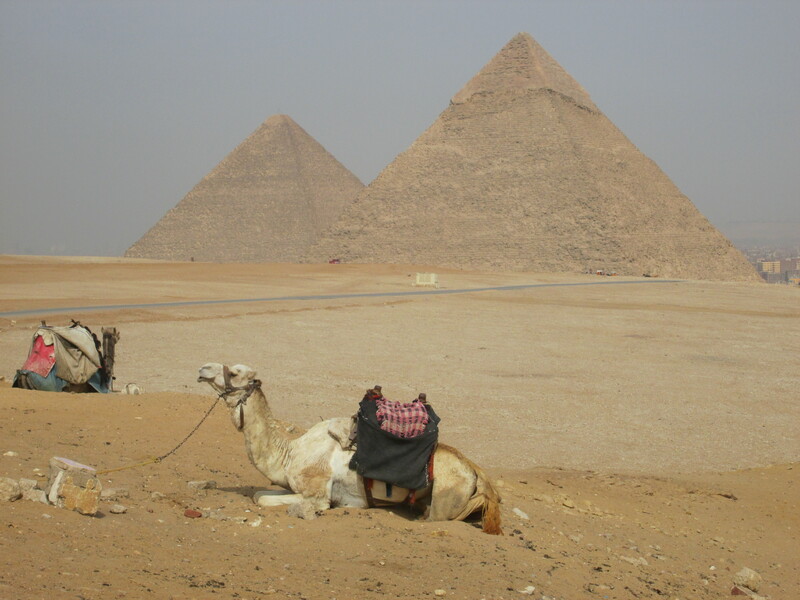 We could pay a little extra to take a camel ride or horse-drawn carriage ride all the way out and around to the “classic” view of the 9 pyramids against the desert backdrop, or we could stay with the van and head to the next stop. I think there are places that spending the extra money is a scam, and I almost always think a camel ride is a scam (maybe I just don’t like camels), however if you find yourself in this position to choose… do it. I opted for the horse-drawn carriage ride, and got one with a little shade cover, which was nice because the afternoon sun was coming on strong and we were starting to feel the heat. The driver was very courteous and the horse was a little flatulent, but it was a side excursion so very well worth taking. This post is so challenging because I continued to find myself at a complete loss for words, my mind (so rarely quiet) stilled into complete shock by the spectacle in front of me. You’ve seen the pictures before, and I’m sure as you look at mine, they don’t seem that different (perhaps even slightly inferior) to others you have seen. I don’t know to relay the feeling, because nothing anyone said to me before conveyed it. Plus, out there on the little path through the desert, the tourists and the city and the poverty and the centuries sort of faded away. I couldn’t hear them, and all I could see were the occasional camel and rider shape in the distance. 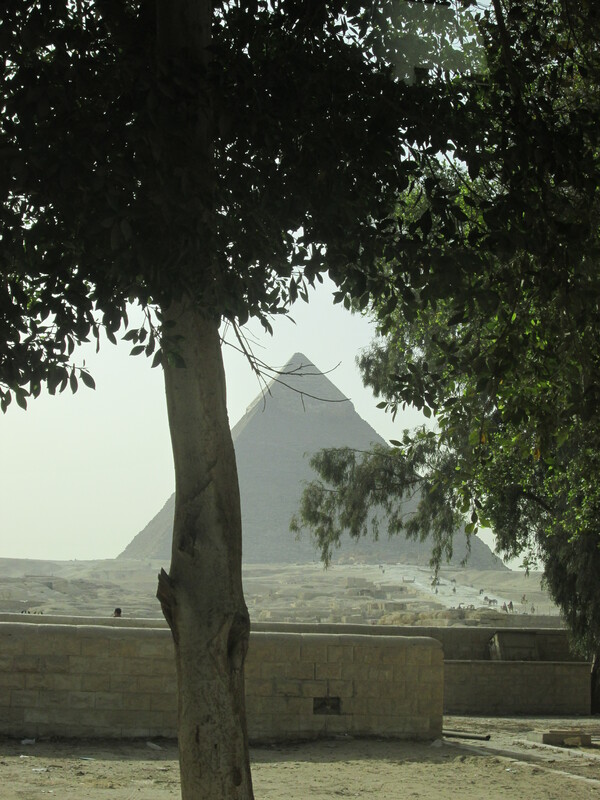 It was a really great way to get some time to myself with the pyramids. The driver stopped several times, some were clearly planned and other times he just noticed I was taking pictures and stopped to make it easier for me. He also took a wide variety of pictures of me in front of the pyramids in increasingly silly poses, most of which will never ever be shown to anyone over the age of 5. The guide had suggested a reasonable tip for this service, and since I felt like he did a good service (and I have intense privilege-guilt) I acquiesced to the extra money above the ride fare. 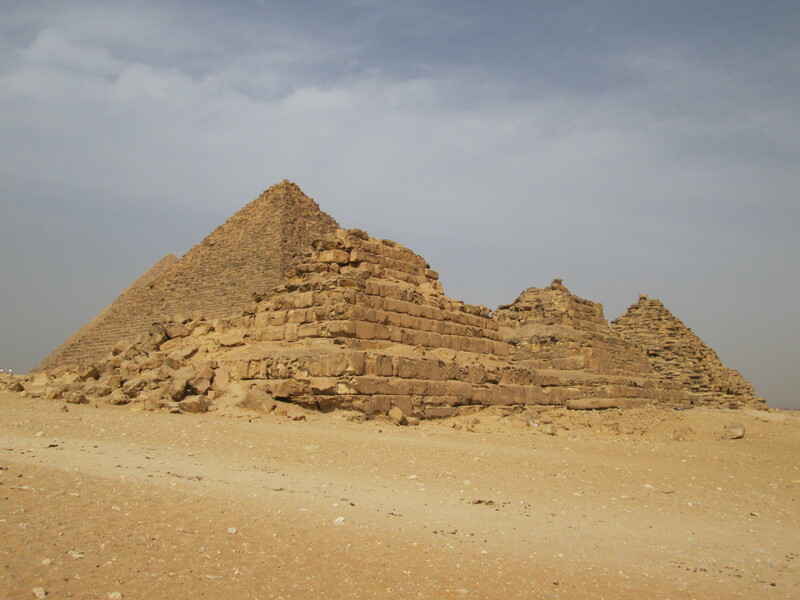 As we rode back toward the pyramids, the views continued to shift and change, and although the afternoon is the hottest part of the day, the bright sun and deep blue sky made for some wonderful photos. We finally reunited with the tour group. While we were waiting for everyone to get back, the guide pointed out a small mound of rock between us and the city skyline. That, he told us, is the Sphinx. 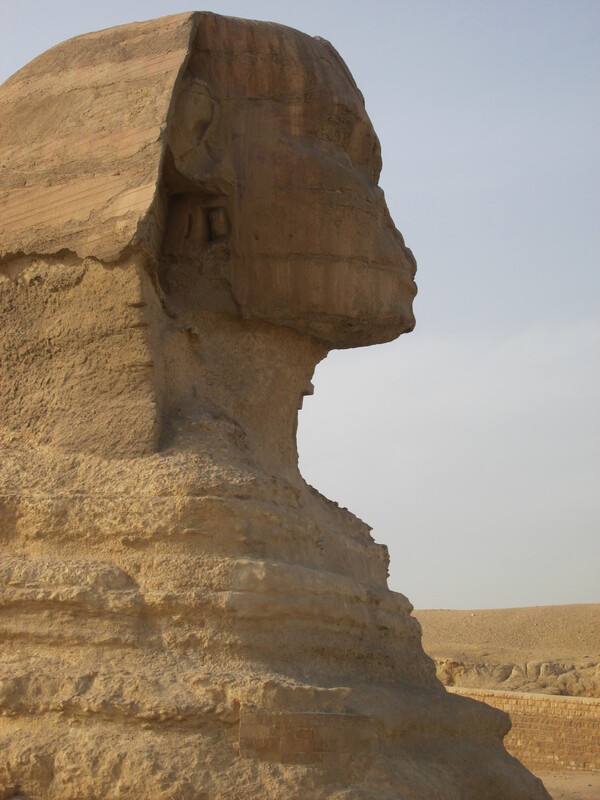 As my perspective shifted, I realized I was indeed looking at the back of the Sphinx’s head, it’s body hidden by the high walls of the pit that it lies in, it’s face looking out over the city. It was so small compared to the mammoth buildings next to us. 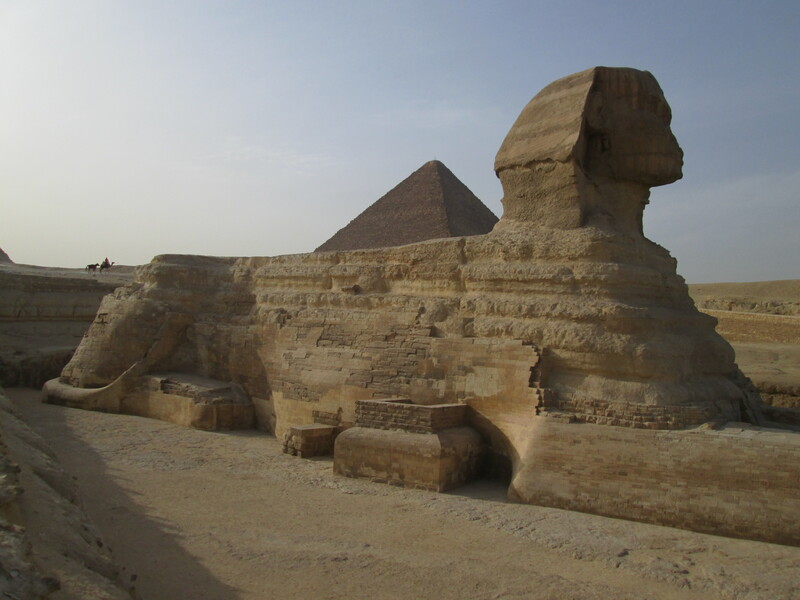 Even the smaller three pyramids in the complex made the nearby Sphinx look tiny. Once everyone was assembled, we headed over to one of the smaller pyramids where we would be allowed to climb down into the burial chamber itself. 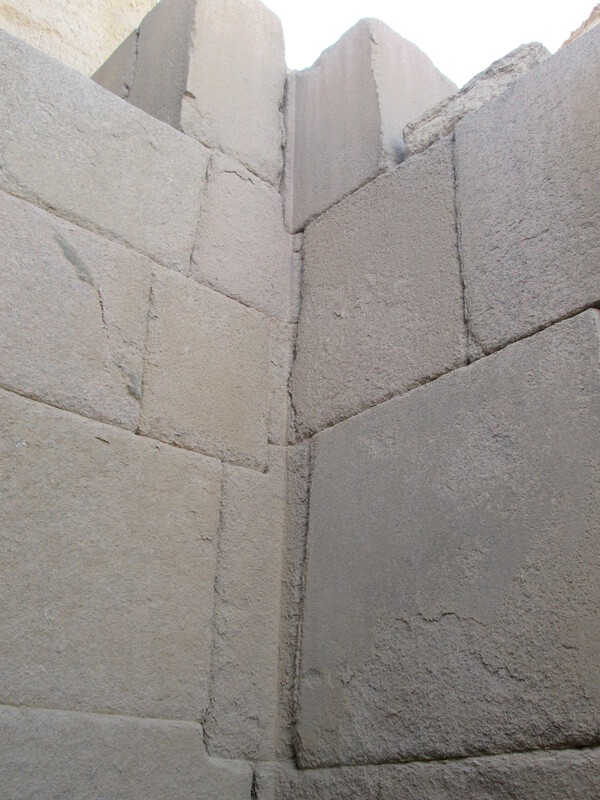 Inside a pyramid! Entrance into a small pyramid was included in the ticket price (which was part of my tour package). 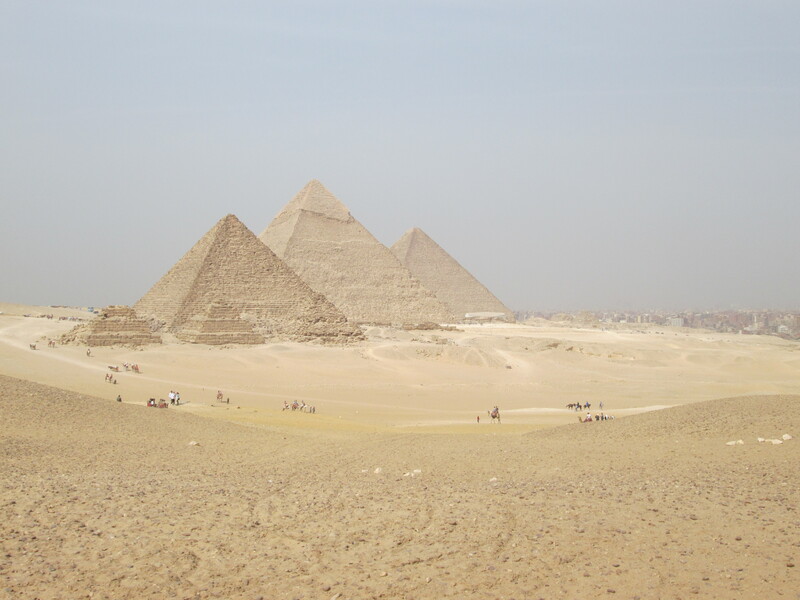 A person could go inside the Great Pyramid for an extra cost. Our guide suggested that we try the small one first to see what we thought. He pointed out that the chambers were not terribly different, and that we would be better off with the free version. Considering the not very hidden extra fees for the river boat and the horse carriage, I was a little surprised that he wasn’t pimping the Great Pyramid more, but it also made me less inclined to go. There were several tour groups gathered at the entrance to the small pyramid we were allowed to enter. They were supposed to be regulating the number of people who would go down at a time, but that didn’t always work out. The majority of my group went down, but I was told to wait because there were too many inside. Some came back rather quickly, deciding the steeply slanting climb down in the narrow passage was just too claustrophobic. When I got my chance, I was surprised at how warm it was. I thought that the thick stone would protect the interior from the heat, but there were also a lot of people. There was a small landing at the bottom of the main passage and then another downward slant at a 90 degree angle to the small chamber. The passages were too narrow for people to pass one another, so we clustered together on the landing waiting for the last of the people coming down from the outside, so that those in the chamber below could get out. I did say there weren’t too many tourists, but this confined space was too much for more than a dozen people at a time, and everyone wanted to see. There was a guide or guard in the chamber, but he was having a hard time regulating people. To be honest, I’m really glad no one panicked because it is a little unnerving to be under tons and tons of rock with a press of bodies and no way out. I finally got into the chamber. There were some ziggurat style “stairs” in one corner, perhaps used as shelving, and there was clearly the carved out pit where the sarcophagus would have lain. These were the two preferred photo-op spots, and some tourists and I traded cameras so we could take pictures for one another and avoid handing our camera off to the native. It was very strange. I think I would have liked to see it alone, to get a sense of the space. It was smaller than I pictured burial chambers being, particularly in comparison with the size of the building that housed it. Climbing down into the sarcophagus pit was fascinating. I’ve always loved graveyards, crypts and mausoleums, and although the stone has been brushed by probably millions of hands since it was carved for it’s only resident, if anything that added to the experience, knowing how many people across time and geography had shared this moment with me. A moment preserved where no sun or rain or wind could carry it away. At some point the room started becoming far too full, and we were running out of safe places to stand. I had become completely cut off from the rest of my group, but I also knew that our guide had been counting heads every time we got on the van and that he wouldn’t leave without me. It took some wrangling and eventually some yelling between guides in Arabic to get the downward flow of tourists to stop and let me back up to the top where my guide was having a heated argument with another guide that sounded roughly like, “see I told you I still had someone down there you idiot”. He was clearly upset with the other guide for not waiting for our whole group to get out before theirs went in, but not upset with me at all. 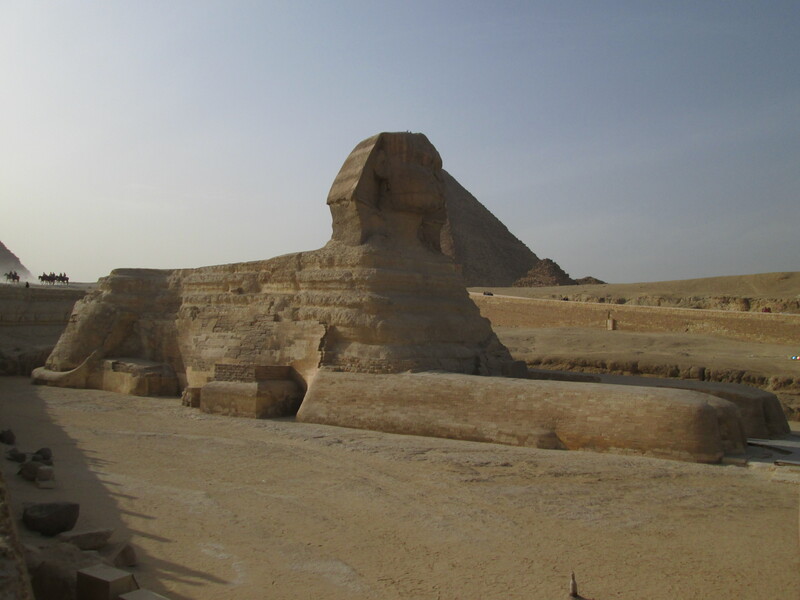 Our time at the pyramids was finished and it was time to head next door to the Sphinx. 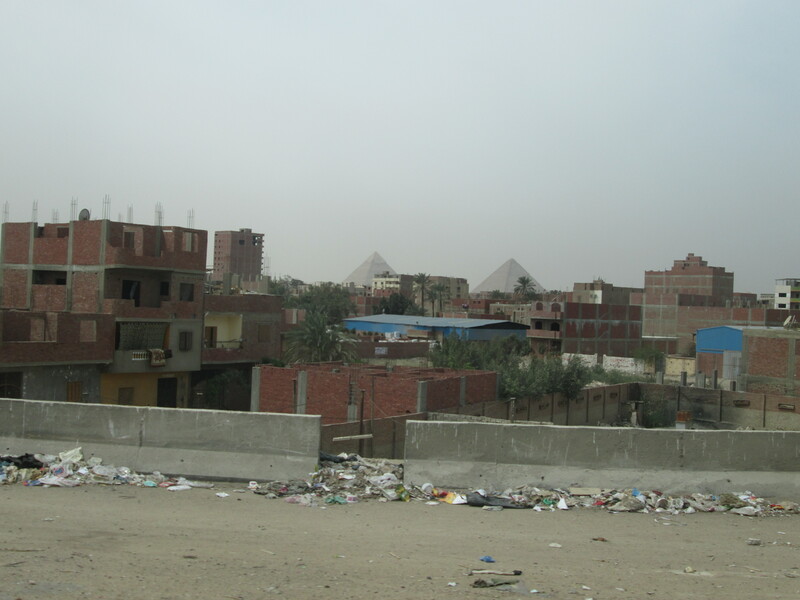 We piled back in the van and drove through some more shanty-shack neighborhoods and pulled into the tourist parking area for the Sphinx park. We used our ticket stubs from the Pyramid park to gain entrance and headed toward the great lion-man past a gauntlet of trinket sellers. However bad I may have felt about the Egyptian economy, almost nothing gets me to stop for cheap trinkets, which is sadly what they all had on offer. I was definitely pleased with my art purchase from earlier, and I gotta say, if you need a souvenir from Cairo, go find a nice shop or two and leave the gew-gaws behind with a firm but polite “La, shukran”. First we entered the temple where we saw the fine stonework that assembled the walls, floors and pillars. Stones here are carved in very irregular shapes, not regular blocks like bricks or legoes, and not even different sized blocks, but really 3D jigsaw style shapes. Each one had to have been carved as part of a larger plan so that they would still fit together so neatly that the proverbial paper could not come between them. Modern engineers and architects think that this kind of assembly gave the structure more stability over time, making it resistant to natural disasters such as floods, high winds or earthquakes. 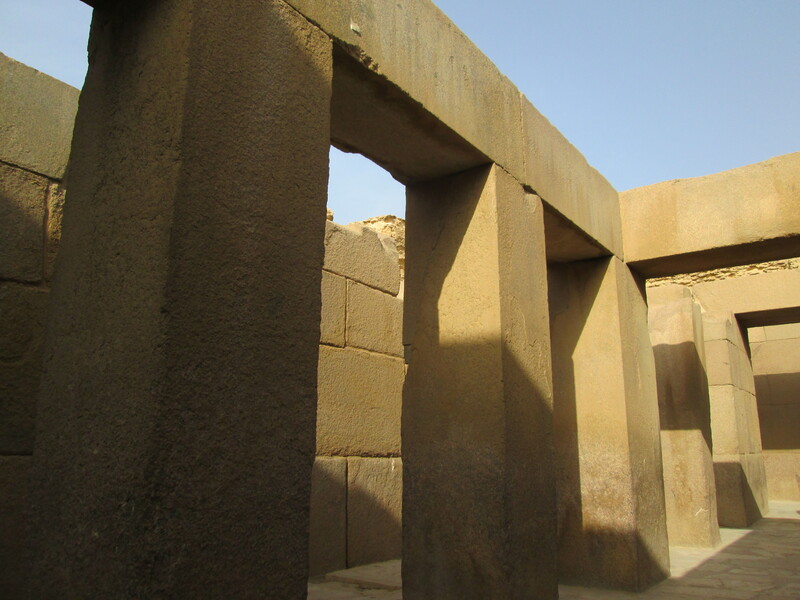 In many ways, standing the the pillared hallways of the temple was just as thrilling as being inside a pyramid. I know there are a few manmade things on earth that are older than this place, but not many, and none as sophisticated. Somebody needs to shrink the fMRI to a portable size, because I really want to know what the brain is doing differently when we see an image of a thing vs when we see the thing. Our guide did some more historical explaining and warned us once again about the scammers lurking around before setting us loose at the Sphinx viewing area. This were a lot of tourists, or at least it felt like it. The Sphinx is made of much more fragile rock than the pyramids, and has worn away and been rebuilt many many times since it’s original construction. As a result, tourists are not allowed to climb on the Sphinx the way we are on the pyramids. There is a wall and fence to keep people out of the pit where the Sphinx was dug out. Nonetheless, there was a tiny little corner where, if you stood on the very edge and leaned into the fence, you could get a spectacular shot of the statue that was totally bereft of people. As I made my way along the railing, admiring the work of the flank and paws, a local noticed me trying to take some selfies (because Sphinx selfie, you’d do it too) and more or less took my camera out of my hand to take pictures for me. I did try to stop this from happening, but eventually gave up arguing and let him take the photos, which were the most ridiculous by far, including me punching the sphinx, me kissing the sphinx and the sphinx kissing my bum. No, you cannot see them. About this time, I decided that it was getting out of hand and took my camera back. This was an argument with some force, because he wanted paying for taking these pictures that I had not requested. I finally got the camera back, simply by refusing to let go. When he asked for money, I gave him the only Egyptian currency I had on me (having left most of my money back on the tour van where it was safe), a whopping 5 Egyptian Pounds (less than 2$). He was also not happy about this and asked for dollars or British Pounds (being used to tourists, the British Pound is widely sought after in Egypt), but I explained that I had no such currency, and that this was all the money I had on me, and perhaps he should be more cautious about taking pictures for people that didn’t ask him to. He left in bad grace and I returned to happily walking up and down the length of the viewing area, dodging children and other people’s photo-ops. I did get my selfie after all, as well as some very nice pictures and a giant amazing memory. With some reluctance, we said farewell to the ancient mysteries and wended our way back to the tour bus. The Sphinx had certainly been worth the efforts of fighting the crowds, but it was a little disappointing not to be able to explore it more after having so much freedom at the pyramids, ah preservation. The tour was over, but we still had a little time before we had to go to the airport, and so we were escorted to another small shop. This was actually somewhat of a relief, because they were pleased to let us use their restroom and wash some of the dust off before we were all seated for the sales pitch. The young man attending us was from a Bedouin family that made their business in trading perfume oils. They mostly supplied the fragrance oils to major brand perfumeries (and some off brand too, I’m sure), but were selling the oils directly in their shop. I have no idea if they were really supplying Chanel or Jean Patou with the base flower oils for their perfume or not. I do know that a lot of those oils do come from Egypt, so it’s possible, and it was air conditioned, so I didn’t mind too much. They offered us a choice of coffee or tea, and some of the other folks were hesitant to accept, believing it was a ruse to put them under obligation to buy. He tried to explain the Bedouin tradition and assure them, but even still, I had to whisper to a few that it really was ok to accept the tea. Once the drinks were passed around and we had exchanged some pleasantries, he began to tell us more about the oils. There were many scents that were individual flowers or spices, and others that were blends. He sampled out several of them and showed us how to use the oil in small drops instead of spraying as normal perfume. At the end of the presentation he asked us what our favorite perfumes were to see if they had a match. At first I couldn’t think of anything because I don’t wear perfume very often, but then I remembered my mother’s tiny little bottle of Shiseido that I had loved as a little girl. He had to go research the name since it isn’t one of the top brands anymore, but he finally came back with a product they called Isis (the goddess not the terrorists), and while I can’t tell you if it was a match, I did really like it, so I bought a small bottle for about 25$, and I can tell it’s going to last me a really long time because I’ve been using it most days since then and the level has hardly gone down at all. So, all in all, another good choice for a shopping stop. Finally we headed back to the airport where we clustered together and talked about the day, comparing notes and feelings, talking about where we had been and where we were going. It was quite late by the time I got back to the hotel in Sharm, and I only had time for a few hours of rest before I had to catch my ride back to the ferry at Taba that would take me across the Red Sea. 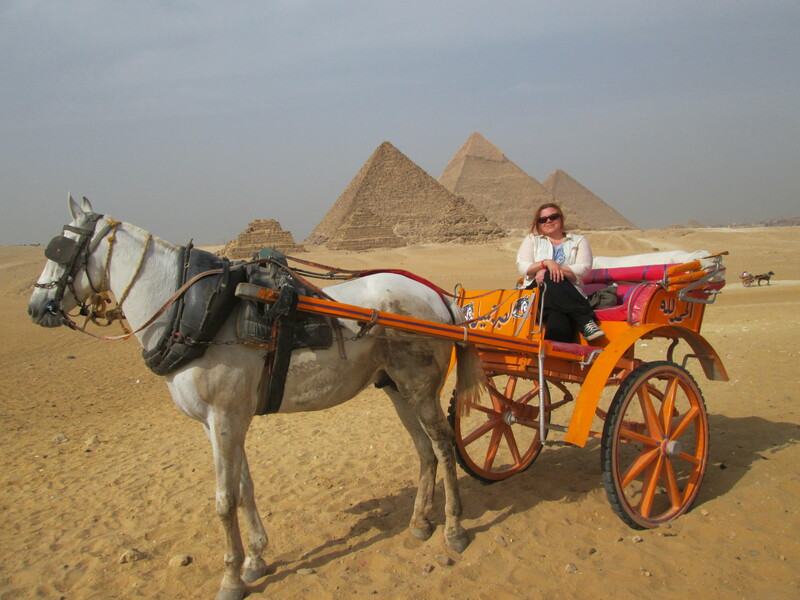 Although I only spent one day in Cairo, it was a spectacularly amazing trip. I hope to go back again someday, to spend more time in the museum and perhaps see some other parts of the city, but whatever happens, I will cherish the memories of the day my childhood dreams came true.